the separation of a mixture of liquid or solid substances using selective solvents or extractants. Extraction consists of three consecutive steps: (1) the mixing of the feed (starting mixture) with the extractant, (2) the mechanical separation of the two phases formed, and (3) the removal of the extractant from both phases and its recovery. After the mechanical separation, a solution of the extracted substance in the extractant (extract) and the residue of the starting solution (raffinate) or solid are obtained. The separation of the extracted substance from the extract and the concurrent recovery of the extractant are accomplished by distillation, evaporation, crystallization, or salting-out (seeDISTILLATION; EVAPORATION; CRYSTALLIZATION; and SALTING-OUT). The advantages of extraction are low working temperatures, the feasibility of obtaining substances from dilute solutions, the possibility of separating mixtures consisting of components with similar boiling points and azeotropic mixtures, the possibility of combining extraction with other technological processes, such as rectification and crystallization, the simplicity of the equipment used, and the ease of automating the various steps. A shortcoming in many cases is the difficulty in completely removing the extractant from the extracted substances. Extraction obeys the laws of diffusion and equilibrium distribution. In extraction from liquids, the concentration y of the extracted substance (B) in the extract phase after mixing of the feed with the extractant and separation of the mixture formed into layers is greater than its concentration x in the raffinate phase. In the case of the mutual insolubility of the extractant (C) and the solvent (A) in the feed, the dependence of y on x for a system in equilibrium (for which y is given as ye) is described by a graph in coordinates x and y (Figure l,a). If the solution is dilute and the substance B in the extract is in the nonassociated or nondissociated state, the ratio ye/x = Ke (distribution coefficient) is a constant term, independent of the concentration, and the equilibrium curve in the x = y graph is a straight line. In the opposite case, Ke is a function of the concentration, and the equilibrium curve is curvilinear. Ke is always dependent on temperature but is virtually independent of pressure and is determined experimentally. As a consequence of the short duration and incompleteness of the mixing of the extractant and the feed, the actual (working) concentration y is always less than the equilibrium value ye. The degree of approximation of y to ye is characterized by the efficiency, and the difference ye – y is its driving force. Equation (1) describes a straight line (see Figure 1, a) passing through the points with coordinates (x2 0) and (x1y1). In the given expressions, x1 and y1 are the concentrations relative to the pure solvent A and pure extractant C. Apparently, under other equal conditions, the amount of extractant used increases with decreasing concentration (x2) of the substance B in the raffinate and decreasing concentration (y1) in the extract. The kinetics of extraction is described by the general mass transfer equation: M = KΔCFт, where M is the amount of the extracted substance, K is the mass transfer coefficient, Δc is the average difference in the concentrations of the extracted substance in both phases, F is the interfacial area, and δ is the time. The value of Δc is determined uniquely by the given concentrations x, y, and ye. Thus, in order to achieve large values of M, K is increased by turbulent flow of the interacting phases and F is increased by dispersion of one of the phases (the extractant or the feed) into fine droplets. The exact value of K cannot yet be calculated theoretically, and thus the efficiency of an extraction process is described, as in the case of rectification or absorption, by the number of equilibrium stages (ideal plates). A graphical determination of the number of equilibrium stages is shown in Figure 1,a. In the case of the partial solubility of the solvent A and extractant C, the equilibrium of the system is represented in the plane of an equilateral triangle (Figure l,c). Each point within the triangle corresponds to a ternary mixture, in which the concentrations of the components A, B, and C are measured by the lengths of the perpendiculars drawn to the opposite sides. The region of heterogeneous mixtures is found below the curve EG (a binodal curve), while the region of homogeneous solutions is found above the curve. Extraction processes occur only in the heterogeneous region, since they involve alternating mixing and phase-separation stages. Upon mixing the feed with some extractant, a ternary heterogeneous mixture P is obtained, which can be separated into the extract Q and the raffinate R with concentration of the extracted substance b. If the raffinate is now mixed with additional extractant, a new heterogeneous mixture P, is obtained, which can be separated into the extract g, and the raffinate R1 with a lower concentration of the extracted substance b1 The position of the lines QR and Q1R1, which are called tie lines, is determined experimentally for each system. By continuing the mixing and separation stages, a further decrease in the concentration of component B in the raffinate may be achieved; that is, the degree of extraction may be increased. It is obvious that the number of tie lines constructed (there can be any number of them) is equal to the number of equilibrium stages. In the example of batch extraction given, the concentration of B in both the extract and raffinate drops after each mixing and phase-separation stage. Countercurrent extraction is often used to increase the concentration of the substance B in the extract and to effect greater extraction of the substance from the raffinate. The essence of the process reduces to the partial separation of the extractant from the extract and the partial separation of the feed from the raffinate and the return of parts of these fractions to the device coun-tercurrently to the departing flow. To separate two components (B1 and B2) by extraction, especially when these components have similar solubility in the feed, two extractants with different selectivities are often used. The feed is introduced into the middle part of the extractor, while one extractant is introduced into the upper part and the other is introduced into the lower part. As a result, the component B1 is transferred to the phase of one extractant while the component B2 is transferred to the phase of the other (Figure 2). repeatedly mixed and permitted to separate. The efficiency of these devices is evaluated by the efficiency of the individual stages or the height of the apparatus, equivalent to one equilibrium stage, called a theoretical plate (seeRECTIFICATION). Perforated-tray extractors and extractors with mechanical agitation have gained considerable importance. In perforated-tray extractors (Figure 3,a), the stages are separated by horizontal perforated plates linked to one another by downspouts. One of the contacting liquids, passing through the plate openings, is dispersed into droplets, thereby creating a large contact surface with the counter liquid, which flows through the downspouts in the form of a continuous phase. Extractors with mechanical agitation are subdivided into rotating-disk extractors (Figure 3,b) and mixer-settler extractors (Figure 3,c). In rotating-disk extractors, the rotating disks agitate and disperse the liquids, after which they separate. In mixer-settler extractors, blade or turbine agitators are located on a common vertical shaft in alternation with layers of stationary packing (Raschig rings, spiral rings, and wire mesh). The mixed liquids, upon passing through the precipitate layers, separate into layers. Extractors with continuous contact of the interacting phases (spray and packed-tower extractors), which are not separated into discrete stages, are also used; their efficiency, when the height is sufficient, is measured by several stages. Spray extractors (Figure 3,d) are equipped with spray nozzles and injectors for dispersing the interacting liquids. Such devices are simple and have high outputs but relatively low efficiency. Packed-tower extractors (Figure 3,e), equipped with Raschig rings or Pall rings, are somewhat more efficient but have lower outputs. 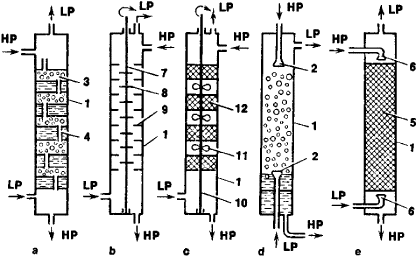 Often used are box-type extractors, which are separated by vertical walls into stages, each of which consists of a mixing chamber and a separation chamber (Figure 4). Turbine impellers located in the mixing chamber stir the liquids and simultaneously transport them from stage to stage. Such extractors may operate for any ratio of feed and extractant with retention of the working concentrations of the liquids at the end of the process. For the extraction of unstable compounds, such as some antibiotics, centrifugal extractors are used whose rotors consist of a series of cylinders, perforated at both ends, or of spiral bands. The feed and the extractant flow countercurrently. The heavier liquid is displaced from the center to the edge, while the lighter is displaced in the opposite direction. 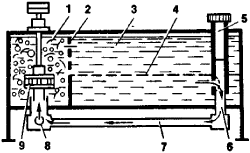 The liquids are contacted in the course of this motion, while dispersion is achieved upon the passage of these liquids through the perforated parts of the cylinders. Extraction from solids is illustrated by the phase equilibrium diagram shown in Figure l,a. In this case, depending on the design of the device used, the extractant passes through a layer of the stationary solid phase or is mixed with the phase, or it moves countercurrently to the solid phase, which is displaced by various transporting devices. 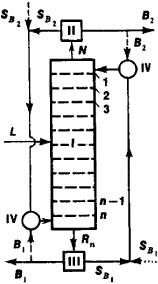 For example, a continuous countercurrent extractor (Figure 5) is used in which the solid phase is displaced by a screw conveyor along a U-shaped cylindrical body toward the extractant. 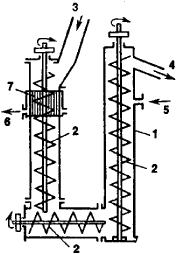 The extract is removed through a strainer consisting of a cylindrical sheet with vertical slits. Extraction is commonly used in the chemical, petroleum-refining, metallurgical, pharmaceutical, and food-processing industries, for example to extract aromatic hydrocarbons from petroleum products, oil fractions from sulfur-rich petroleums, phenol from waste liquids, antibiotics from culture mediums, metal (including rare metals) or their compounds from ores, and many natural organic compounds from plant matter (sugar from sugar beets and sugarcane, oil from soybeans and oil-bearing seeds, tannin from tree bark, and pharmaceutical preparations from plant roots and leaves). Analytical chemistry and radiochemistry. Extraction from aqueous solutions has found greatest use for the chemical analysis of elements, as well as in the separation, concentration, and purification of radioisotopes. Alcohols, ketones, ethers, esters, amines, phosphate esters, and chelate-forming compounds have served as extractants in these techniques. Such extractants are used in mixtures with diluents, which are liquids serving to improve such physical properties as viscosity and density and the extraction properties of the extractants. Kerosene, benzene, and chloroform may serve as diluents. The major uses of extraction in analytical chemistry are the selective extraction of the elements desired from mixtures for quantitative analysis and the determination of the content of impurities in substances being studied, which is especially important in methods for the production of highly pure substances. The advantages of extraction in analytical chemistry are high selectivity, simplicity, and broad application; that is, it affords the possibility of separating virtually any element. Extraction is used in radio-chemistry mainly for the purification of various radioactive compounds by the removal of impurities, the removal and separation of radioisotopes from irradiated targets, and the separation of natural radioisotopes from various objects. The rapidity of the process is also an advantage of extraction in working with short-lived radioisotopes. The extractants in such processes must have radiation stability. Remote-control devices are used in the extraction of radioactive substances, providing safety for personnel. The use of extraction in analytical chemistry and radiochemistry is often combined with other methods, such as chromatography, coprecipitation, and distillation. Pratt, G. R. K. “Ekstraktsiia zhidkost’—zhidkost’ v teorii i praktike.” In the collection Zhidkostnaia ekstraktsiia. Moscow, 1958. Fomin, V. V. Khimiia ekstraktsionnykh protsessov. Moscow, 1960. Ekstraktsiia v analitcheskoi khimii i radiokhimii. [Collection of articles.] Edited by Iu. A. Zolotov. Moscow, 1961. Shkoropad, D. E., and I. V. Lyskovtsov. Tsentrobezhnye zhidkostnye ekstraktory. Moscow, 1962. Brounshtein, B. I., and A. S. Zhelezniak. Fiziko-khimicheskie osnovy zhidkostnoi ekstraktsii. Moscow-Leningrad, 1966. Zolotov, Iu. A., and N. M. Kuz’min. Ekstraktsionnoe kontsentrirovanie. Moscow, 1971. Khimiia protsessov ekstraktsii. Moscow, 1972. Aksel’rud, G. A., and V. M. Lysianskii. Ekstragirovanie. Leningrad, 1974. A method of separation in which a solid or solution is contacted with a liquid solvent (the two being essential mutually insoluble) to transfer one or more components into the solvent. The act or process of pulling out a tooth.